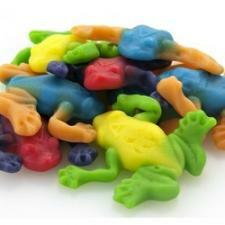 Rainforest frogs will brighten up your day with their rainbow colors and tropical flavors. Strawberry, Grape, Sour Lemon, Sour Apple, Blue Raspberry and Orange. They are shaped and textured to replicate real frogs. Ing. : Corn Syrup (From Corn), Sugar (From Beets), Water, Gelatin, Citric Acid, Lactic Acid, Natural and Artificial Flavors, Vegetable Oil (Palm) and Carnauba Leaf Wax (To Prevent Sticking), Titanium Dioxide (Color), FD&C Yellow 5, Yellow 6, Blue 1, Red 40.